OOooo Aaaaa! KI KI KI !!! Sorry for the lack of updates recently. Things have been rather busy lately, especially with the (whisper) new boyfriend . 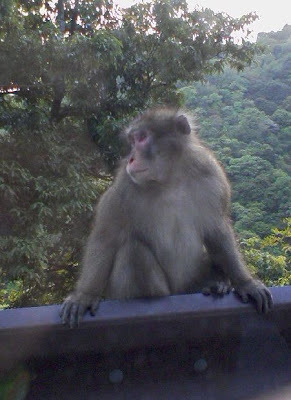 We spent Golden Week driving around the Kansai and I finally got to go to Minou and see the famous Minou Monkeys up-close-and-personal. I had heard rumors that the monkeys were pretty wild, but they seemed calm to me. Of course we were safe inside the car, so maybe it would've been different if we were walking around. We also saw the Minou waterfall, which was lovely; but we didn't get to eat any maple-leaf tempura because we went too late at night.